Use the diagram to the left to show how the caduceus is mapped out over the chakras. 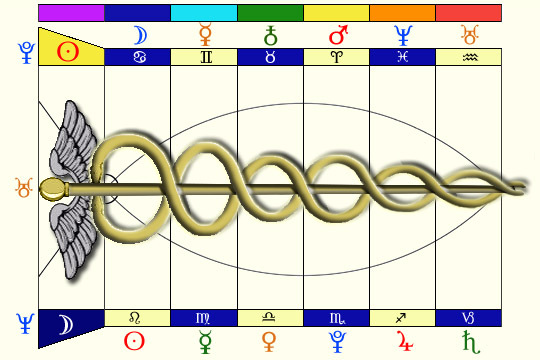 Note that the snakes align with each other at every chakra location indicating that integration of the masculine and feminine energy is necessary in order to activate the chakra. The snakes are representative of the universal cosmic masculine and feminine energies as they interpenetrate the individual 3D reality. The pole at the center represents the central channel (Sushumna) through which attainment of the divine (Spirit) is accomplished. The wings indicate that the individual must transcend the limited 3D reality of duality in order to unite with Creator. The caduceus symbol has quite a colorful history, but only a basic representation will be made here. The intertwining snakes represent the male and female energy of the cosmos (duality) spiraling about a central channel (the created one) that terminates at a ball--sphere--representing Nirvana (Oneness). The wings represent that the energy there is transcendental in nature, and does not have physical form. This is appropriate in that it represents the location of the 7th chakra, and thus indicates the transcendental Self. The Realm of universal opportunity (7th chakra) is revealed in the Pineal gland as the division of Spirit and Matter is manifested in light. In the manifestation of light, Pluto acts as the ray of life and operates as the father--bearing the seed of the Soul incarnation--and governs the 7th chakra by day. Neptune acts as the ray of love and operates as the mother, providing the space within which the seed evolves through time. Neptune governs the 7th chakra by night, and as the ray of love represents a harmonic of the universal Divine Love, Neptune rules through the Pineal gland (a master gland in the body). Uranus acts as the ray of wisdom and operates as the created one, outpicturing as the Soul desire to incarnate. Thus, the seed held within Pluto represents the field of all opportunity for that incarnating Soul. And just as the seed evolves through Life as the Soul, the seed within that Soul develops based on its evolutionary progression through Life. The location where the heads of the snakes meets represents the division between the 7th and 6th chakras, which acts as a lens through which the cosmic Spiritual energy (7th chakra spirit) is reflected into the realm of physicality. Thus, the 6th chakra represents the location where Divine Light is reflected in the Brow chakra as a direct representation of the Souls desire to incarnate. Here, the 3 outer planets of Pluto, Neptune and Uranus manifest as the 3 rays of visible light (life, love and wisdom), as the one vibration of unity condenses into form. Here the drop of divine nectar drips down from Bindu as a function of the light interpenetrating the crystalline structure of the Pineal gland (7th chakra). The realm of the drop itself represents the field of all possibility for the incarnating Soul, while the manifestation of the 3 rays represents the holographic imprint of the Soul desire resident in the birth contract. Pluto has a dualistic nature, similar but quite different from Mercury. In its Physical aspect, Pluto represents the father of Creation, carrying within it the seed of the created one that outpictures as Uranus upon birth. This seed itself represents the zero, or unmanifest opportunity of the universe, and thus represents the spiritual aspect of Pluto. Thus, Pluto becomes the ambassador of the universe as it holds within itself the seed through which the universe allows a Soul to incarnate into nature. Neptune then acts as the female aspect of the universe, taking within itself the seed of the universe and providing the space within which the seed can be created into form. When the cosmic play outpictures in the 3rd Eye, the seed reflects as the backdrop through which the holographic form of the Soul manifests, and is represented by the Moon. At the same time, the Sun represents the manifestation of the 3 outer planets as they are brought into form during the birth event. The outpicturing of the 3 rays of cosmic light now becomes manifest as the Soul expression in the 3rd Eye evolves through time. At the moment of birth, the universe crystallizes Pluto (1) along with Neptune (2), and the created one, Uranus (3) in The Field of all possibility (0, and then 4). The first division of time separates the zero (the field of all possibilities represented by the Moon) from evolutionary expression of number (Sun) within which it is born--and outpictures as the division of Spirit and Matter. In form, the 3 outer planets, as well as all other universal bodies, manifest to provide the physical substance necessary for the incarnating Soul (represented by the Sun as the active principle of the universe) to adjust its position in the realm of Spirit. As we have seen, Spirit is viewed as the field of all possibilities represented by the Moon as the passive principle of the universe. While this is manifesting as the 7th chakra, the second division of time manifests as the polarity of male and female--and outpictures as the physical Sun and Moon being the fundamental governors of the 6th chakra.